With a common name, Para Todo, meaning "for everything," there is a hint of just how much benefit Suma Root may be to your health. 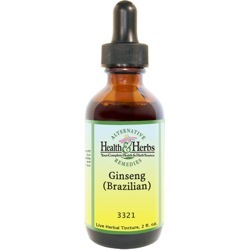 Sometimes referred to as the South American version of ginseng, it has become a popular tonic that has been used to boost the immune system and to fight temporary depression and fatigue. It has been used for Epstein-Barr Syndrome and Chronic Fatigue Syndrome and it may make a difference in energy levels and stamina to a tired body. Suma is considered a tonic and an agent that normalizes bodily functions during stressful situations, helping the body to adapt and return to an overall sense of well-being. It is regarded as an excellent tonic for recovering convalescents. It is used to treat exhaustion resulting from debilitating viral infections, such as Epstein-Barr disease and Chronic Fatigue Syndrome. It is considered to be a tonic that is helpful to people who may be recovering from the flu, as well as anyone else who lacks energy and stamina. The herb promotes healthy energy levels and combats the effects of fatigue and stress. Suma has been called "the Russian secret," as it has been taken by Russian Olympic athletes for its muscle-building and endurance-enhancing benefits, without the side effects associated with steroids. The native tribes of the Amazon rainforest have used Suma for at least three hundred years as an effective aphrodisiac, and it is believed to help restore sexual function in both men and women. Suma is said to boost up the immune system (especially a weakened immune system) and may be helpful in alleviating some of the effects associated with AIDS and other wasting illnesses. As an anti-inflammatory, Suma is thought to be of help in easing the pain and inflammation of arthritis and other joint discomforts. Suma is said to fortify hormones (especially estrogen) and has been effective as a tonic for the unpleasant symptoms of menopause, including hot flashes and emotional swings. This same quality is believed to alleviate the discomforts of premenstrual syndrome (PMS). It has been included in the folk medicine of several rainforest tribes as a calming agent, and it is still being used today. Suma is thought to be beneficial in supporting healthy cholesterol levels in the blood and may be helpful in combating high blood pressure. In 1995, a U.S. patent was filed claiming some beneficial effects of Suma Root against Sickle-Cell Anemia. In a human study, patients taking Suma Root for three months increased hemoglobin levels, inhibited red blood cell sickling and, generally, improved their physical condition by reducing side effects during the treatment. Ingredients: Suma Root, Structured Water, 20% Alcohol. Non-Alcohol: Suma Root, Structured Water, Vegetable Glycerin. Contraindications: Pregnant and nursing women should not use Suma Root. Since Suma may have estrogen-like effects, it should not be used by those with estrogen-positive cancers.